Enersize Oy (”Enersize”) has completed a private placement of approximately 1.2 MEUR in preparation for its planned IPO during the second quarter 2017. Among the investors are both German industrial investor Heinz Dürr Invest GmbH as well as Swedish truck manufacturing group Scania, through their newly established venture capital fund Scania Growth Capital. The capital raise was executed to accelerate Enersize’s revenue growth and to further develop the company’s proprietary software to utilize artificial intelligence for automated monitoring and analytics. Investors in the private placement have also given commitments to further invest into the company at the coming IPO on Stockholm First North. Cleantech Invest is the largest shareholder in Enersize with an ownership of 36,6% after this investment round. Scania Growth Capital has recently launched the initiative to make investments into growth companies with strategic connections to Scania, and one of the focus areas is technology for smart factories. Heinz Dürr is one of the major shareholders of German Dürr Group and chairman of the Dürr Group supervisory board. Dürr Group is one of the leading suppliers for global vehicle manufacturers and has operations in 28 countries. There was a lot of investor interest for the private placement and a large number of investors became new shareholders of Enersize. Industrial compressed air systems use almost 5% of global electricity and is used in 90% of all manufacturing plants. Through Enersize’s in-house software for data collection and analysis, up to 30% energy savings in industrial compressed air systems can be achieved. Enersize shares the profit from the achieved savings with their customers, who do not have to pay any upfront costs for using the technology which makes the Enersize offering very attractive for the customers. One of the world’s largest flat screen manufacturers, renowned vehicle brands and steel plants are among existing Enersize customers. 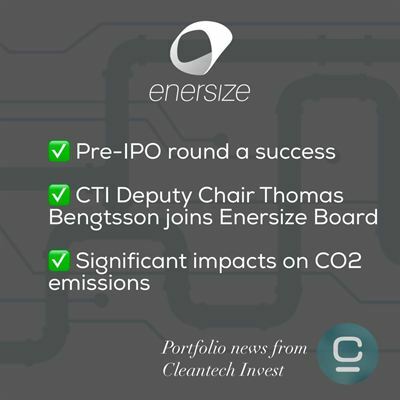 In preparation for the IPO Enersize has also strengthened the board of directors and elected Thomas Bengtsson as a new board member. Thomas is Clentech Invest’s deputy chairman, private investor in several cleantech companies and has a large network of Swedish growth investors.